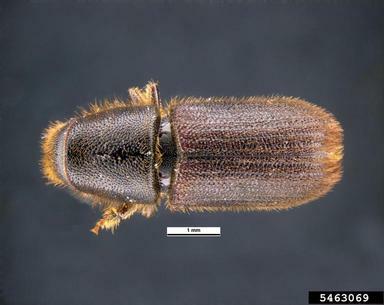 The redhaired pine bark beetle (Hylurgus ligniperda) is a pest of pine trees. This pest is attracted to fresh stump, slash and logging debris. It is widely distributed in Europe and Mediterranean areas. It was first found in northeastern US in 1994. Hylurgus ligniperda are vectors of Leptographium fungi. Surveys are conducted because of the presence of potential host material in Wyoming. To date, it has not been found in Wyoming. Two hundred thirty-four traps have been placed throughout twenty-three counties in Wyoming since 2008. The redhaired pine bark beetle survey is conducted by the Animal and Plant Health Inspection Service, Plant Protection and Quarantine. A Lindgren funnel trap with host attractant is placed on or near the host plant from May until September. If suspects are found they are sent to a regional entomologist for further identification.